Highlights: * 58 percent of Chicago arts-school alumni took up residence in the city within 5 years of the date of their last attendance. Of the regions compared in this report, only New York City has a greater portion of its arts-school alumni taking up residence in the city within 5 years, at 66 percent. 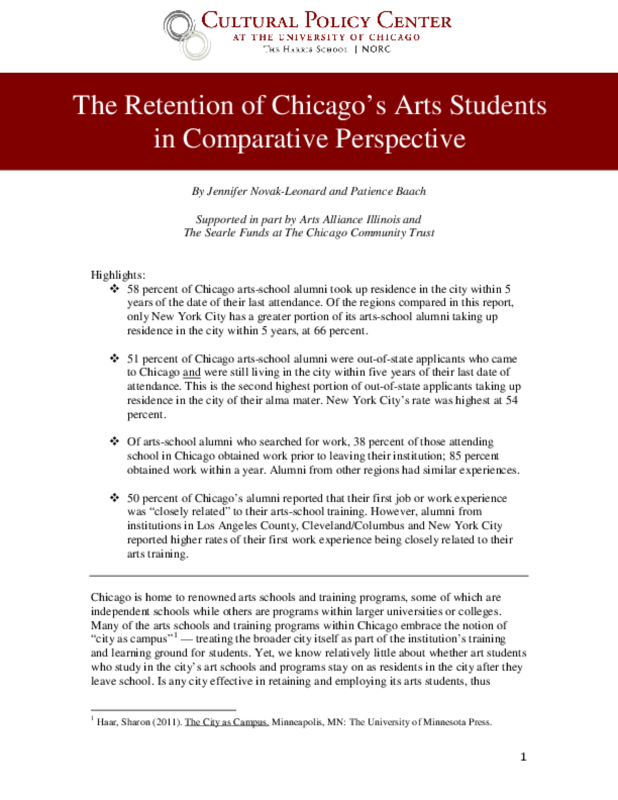 * 51 percent of Chicago arts-school alumni were out-of-state applicants who came to Chicago and were still living in the city within five years of their last date of attendance. This is the second highest portion of out-of-state applicants taking up residence in the city of their alma mater. New York City's rate was highest at 54 percent. * Of arts-school alumni who searched for work, 38 percent of those attending school in Chicago obtained work prior to leaving their institution; 85 percent obtained work within a year. Alumni from other regions had similar experiences. *50 percent of Chicago's alumni reported that their first job or work experience was "closely related" to their arts-school training. However, alumni from institutions in Los Angeles County, Cleveland/Columbus and New York City reported higher rates of their first work experience being closely related to their arts training. This report complements An unfinished canvas. 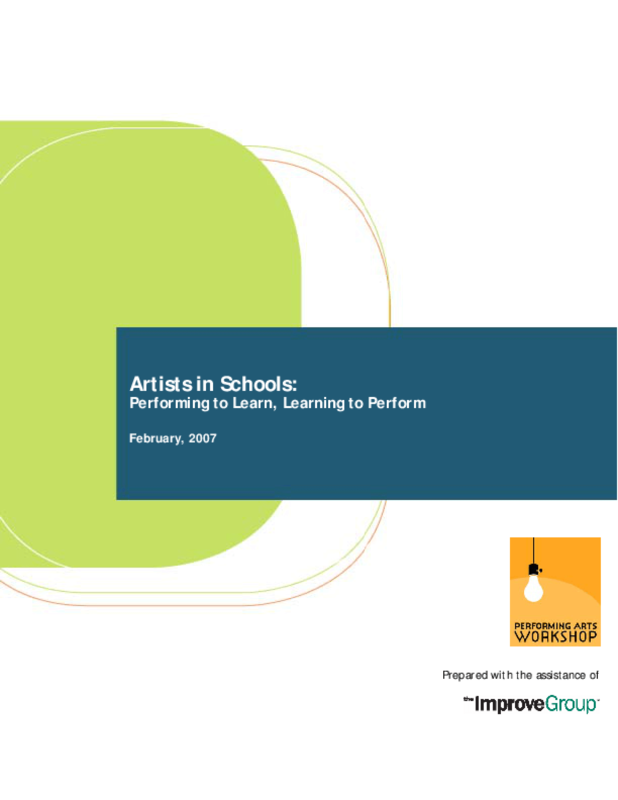 Arts education in California: Taking stock of policy and practices (Woodworth et al., 2007). 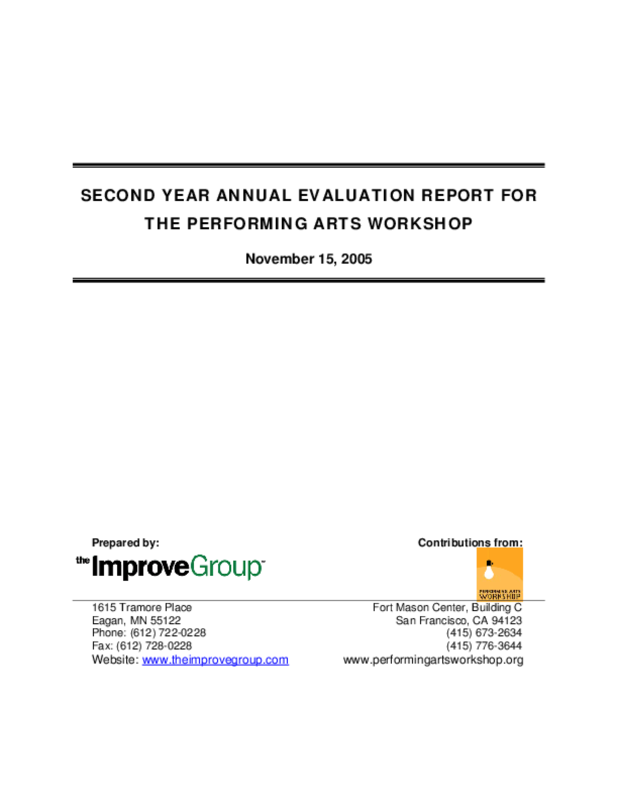 The research supporting An Unfinished Canvas was undertaken to document the status of arts education in California schools and assess the extent to which schools were meeting state goals for arts education -- namely a sequential, standards-based course of study in music, visual arts, theatre, and dance. As part of that research effort, we included a sufficient number of schools in the nine Bay Area counties to enable us to report comparable data for each of the Bay Area counties as well as to draw comparisons between the Bay Area and the rest of the state. 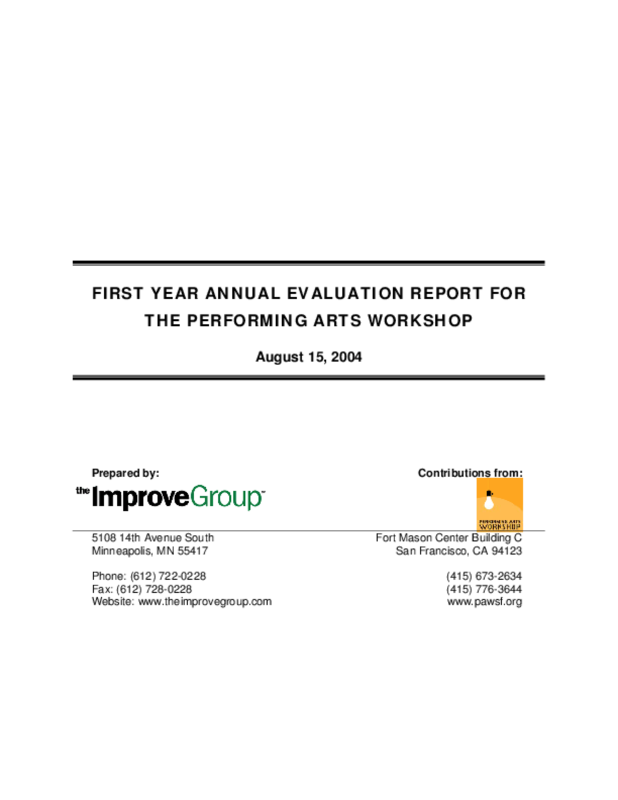 For two years, the Workshop participated in an evaluation project run by the California Arts Council. 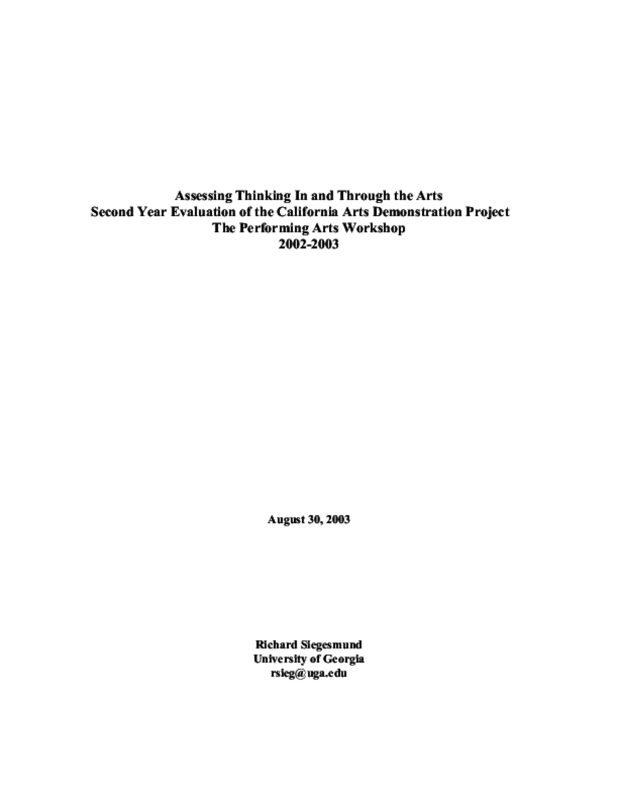 The goals of this project were to identify potentially "at-risk" student populations and then evaluate the effects of a Creative Movement or Theatre residency in the classroom. Areas for student improvement were based on the Workshop's Cycle of Artistic Inquiry which seeks to demonstrate the process of critical thinking through arts learning. 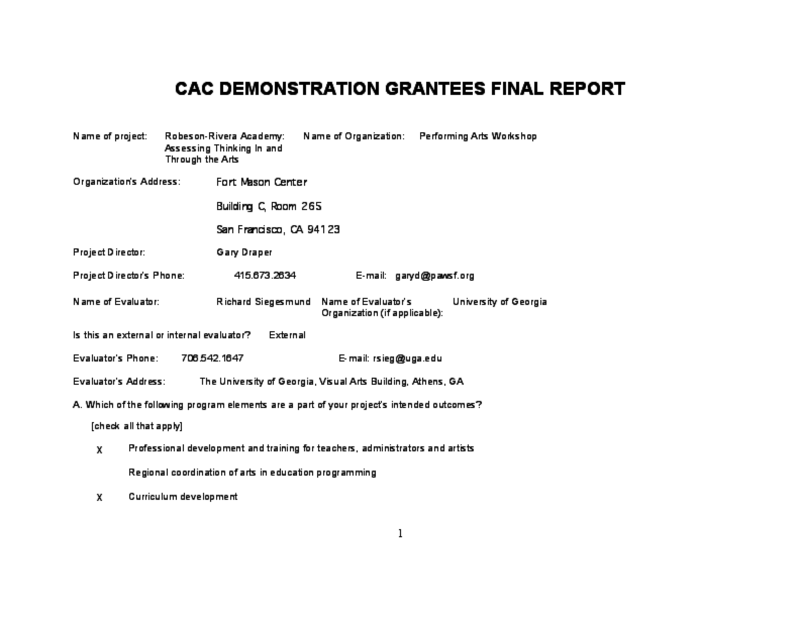 The following reports deal with the findings of this project at three separate locations: The Paul Robeson & Diego Rivera Academy, John Muir Elementary, and Mission Education Center.